Scientific assessment of the biodiversity of the salt working sites. From this biodiversity analysis, identify dispositions of the landscape that generate optimal biodiversity for the correct functioning of ecosystems in salt working areas (Action 6.2). Define guidelines to develop nature tourism in the salt working sites with measures for conservation or to improve the potential of the natural and landscape heritage, including changes in water management. The aim is to maintain or restore specific habitats to the salt working sites for nature tourism, with the application of specific measures by some partners. 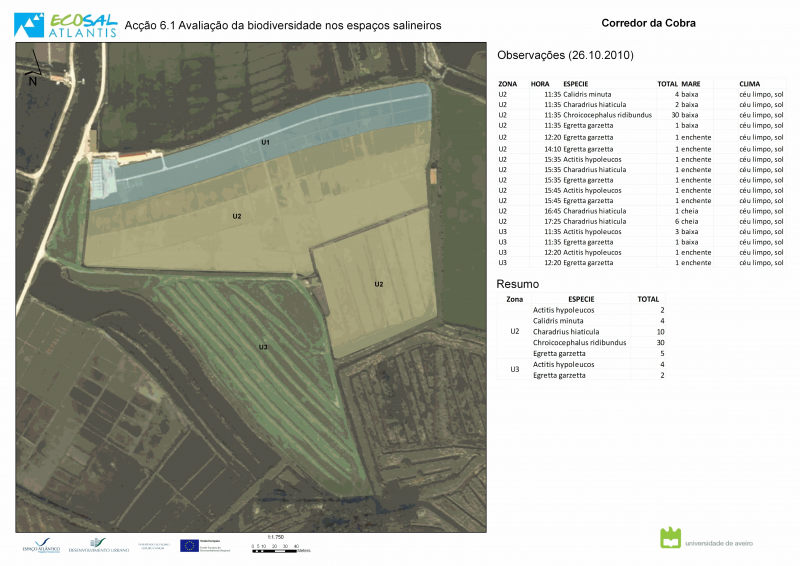 A specific data base will be created in order to show as clearly as possible the composition of the plant, bird and fauna communities, their respective numbers and spatial distribution as well as their development over time, related to the management of the salt works, and based on bibliographic data. In the absence of any bibliographic information on the sites, field work will be carried out in order to update the information on plant communities and describe them in terms of habitat under the Eur-15 format. Definition of measures for conservation or improvement to the nature heritage potential of the salt working sites. These guidelines will take into account the specific characteristics of each one of the participating sites and will also allow the implementation of biodiversity concerned measures. Responsible partner: Asociación Cultural de Amigos de las Salinas de Interior, Communauté de communes Océan-Marais de Monts, Bournemouth University e Universidade de Aveiro. Realisation of measures in the different salt works. Assessment of the biodiversity of the salt working sites based on a jointly defined methodology that links together published references, spatial and aerial remote sensing as well as the field work (with measurements). Implementation of guidelines for the development of nature tourism and proposals for suitable facilities for nature watching.